Skiers and riders dream big. 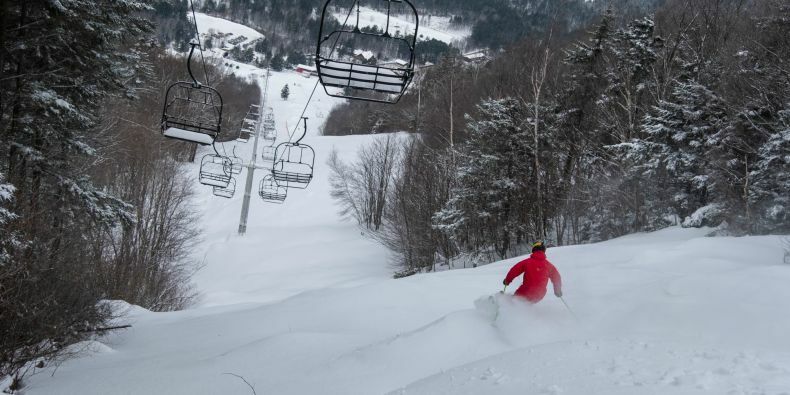 One of the most popular of those dreams - having the mountain all to oneself – is coming true thanks to three Vermont ski areas. Magic Mountain has been renting out its ski area for private events since 2016. Geoff Hatheway, Magic’s President, saw an opportunity to make the coveted mountain-to-yourself fantasy a reality and made Magic the first ski area in Vermont to implement it. Hosting private events is “a way for us to make some money on a day we’re typically not open, and for whatever business or charity … we’re working with to have a really special day,” he said. Pico and Suicide Six have also been renting privately. Pico offers “an unforgettable experience and a guaranteed way to get you first chair, fresh snow and no lift lines.” Suicide Six provides a private skiing and riding package starting at $7,500 for up to 100 people including lift tickets, rentals, meeting space and more. Bolton Valley: In December 2017, Bolton Valley opened an in-house backcountry-specific guiding and instructional program, complete with top-of-the-line rental and demo fleets of alpine touring and splitboarding equipment. Building on its reputation for having some of the best and most accessible backcountry terrain in the Eastern U.S., this program makes Bolton Valley a premiere destination for skiers and riders looking to move beyond lift service, as well as cross country skiers looking to access more aggressive terrain. Visitors can explore thousands of acres of high-mountain wilderness terrain while learning the ins and outs of alpine touring, backcountry safety, and self-reliance. With its proximity to the alpine resort and all its amenities, the Bolton Valley Backcountry Program also provides a unique experience for parents, in that childcare and kids ski school programs are all available on-site while they explore the wilderness terrain. Bromley Mountain: Guests at Bromley have always shown a love for après-ski entertainment. Nothing beats kicking off your boots after a long day of skiing or riding and enjoying an ice cold brewski (or hot cocoa!) with family and friends. The experience just got a whole lot better with this year’s renovations to Bromley’s Wild Boar Tavern (located at the base of the mountain). The goal was to improve the overall flow and aesthetic for a more comfortable atmosphere. In addition, Bromley has expanded its events calendar with more free, family-friendly entertainment for everyone. Jay Peak: Weather-proofing the New England ski and ride vacation is a trend Jay Peak started when they opened their Ice Haus in 2010. The arena offers public skating times, figure-skating lessons and stick-and-puck pick-up games. Jay Peak expanded the weather-proof menu in 2011 with the 60,000-square foot Pump House, an indoor waterpark that guarantees exhausted children. And last winter they rolled out their version of a red carpet to Clips & Reels, an entertainment center that features a 142-seat movie theater along with a Clip ‘n Climb facility. Killington: At Killington Resort it’s all about four seasons of beastly activities, and now the Beast 365 All-Seasons Pass gives guests access to it all. This pass offers the best value to experience everything at Killington, all year long. It all starts in summer with unlimited lift and trail access for mountain biking, plus golf course greens fees and access to the Adventure Center including the new WreckTangle. And of course, unlimited winter access to the longest season in the East. Mad River Glen: The Naturalist Programs at Mad River Glen become more popular every year. Ever wonder why there are so many snowshoe hare tracks on the slopes? Have you seen the bear bites and scratches on trees and questioned the meaning behind them? Perhaps you have encountered moose tracks and pondered how they can survive the winters. Valley visitors can learn more about these animals, mountains and forests of Vermont by taking part in one of Mad River Glen’s award-winning Naturalist Programs. Stratton: A variety of diningoptions line Stratton’s Village just steps from the lifts, lodging and amenities. Stratton BaseCamp is the resort’s newest offering. Located next to the gondola in the main base area, this renovated shipping container is the perfect spot to grab a quick bite or drink. The menu will change seasonally and features some of Vermont’s finest craft brews. The open-air, rooftop seating offers a whole new view and is sure to make BaseCamp an après hot spot. Hearty and healthy selections from the Base Lodge Market go beyond the traditional fingers and fries fare with hand-carved sandwiches, Asian-inspired noodle bowls and made-to-order salads crafted with locally sourced ingredients as part of the Vermont Fresh Network. Grizzly’s serves a line-up of taps featuring a rotating selection of Vermont craft beers and ciders with a hearty menu of favorites including a heaping platter of nachos. Restaurants range from family friendly to fine dining, all in the no-car needed resort Village. Suicide Six: The kick-off season of the new Elemental Bike Park was a success at Suicide Six. The mountains welcomed riders of all ages and skill levels with a variety of progressive terrains, pump tracks, a Strider park and a skills development area. Advanced riders tested skill levels on the flowing jump lines and technical DH-specific runs. Certified coaches, premium bike rentals for children and adults from Kona and Santa Cruz, scenic chair rides, hiking, craft beer and farm-to-table fare were available for guests. Okemo: Sixty is the new 40! That means mature skiers and snowboarders are staying fit, active and on the slopes well into their golden years. They are also sharing their lifelong passion for snowsports with their children and their grandchildren. With its dedication to snow quality and dependable surface conditions, Okemo is the perfect choice for a multi-generational, family ski getaway. A wide variety of trailside and mountainside lodging options delivers great ski-in/ski-out convenience. Okemo also offers an assortment of alternative activities for families to enjoy together. At Okemo’s Jackson Gore base area there’s ice skating, snow tubing, a mountain coaster, kids’ snowmobile tours, SnowCat excursions, swimming pools, a fitness center, spa services, dining, shopping and more. Magic Mountain: Magic has been a leader in uphill traffic with alpine touring (AT) growing in popularity. That vibe continues to be actively supported as Magic has seen a twofold increase in traffic going up by either skinning or snowshoeing. Magic has introduced one of the first alpine touring centers in partnership with Salomon with AT rental gear for first-timers, along with lessons and tours. New gear will be added this year. Long known for its extensive and challenging lift-served tree skiing, Magic will have guided backcountry tours this coming season with shuttle van pick-ups, all of which must be reserved in advance through the Snowsports Learning Center. Snowshoeing trails have also been marked this season, and snowshoes are also available for rental. Mount Snow: Mount Snow makes a point to not forget the next generation, as they’re the future of our sport. Sales of the Drifter Pass, which offers unlimited skiing and riding for 18-29-year-olds, all for just $399, are up 47 percent year-over-year, making millennials the largest group of passholders the resort has. With the #1 rated terrain park in the East, events and festivals such as the Minus Zero Festival, and tons of great après offers, it’s no wonder the next generation of skiers is calling Mount Snow home. Uphill access has been steadily growing over the years with the increase in companies selling and marketing touring equipment. 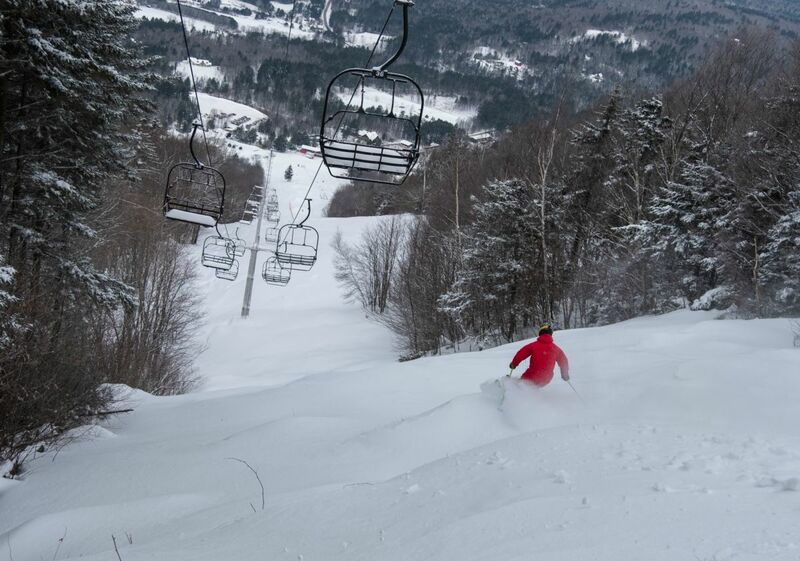 To stay on top of this, Mount Snow offers uphill access throughout the entire resort during operating hours. Guests simply need to purchase an uphill pass or have an uphill endorsement on their season pass. Sugarbush: Uphill travel at Sugarbush continues to see a huge increase in popularity over the last few seasons. The resort offers free uphill travel passes valid for skinning up designated routes at the resort before and after lift-served operating hours. Sugarbush enters its fifth year with such a policy. The resort hosts Tour De Moon several times throughout the season – a guided skin to Walt’s at the Glen House at Mt. Ellen and also offers an uphill travel option for Allyn’s Lodge Fireside Dining. Smugglers’ Notch: The top trend at Smugglers’ Notch Resort? Family togetherness. Families have always enjoyed skiing and riding together on their Winter vacations at Smugglers’. Last Winter there were more activities in the mix, as the resort responded to requests by families for even more activities to enjoy together. Families chose to vary their vacation days by joining craft sessions, broomball challenges, scavenger hunts, Snow Cat tours, story times, and pool games, which were included in their Smugglers’ vacation package. Most popular activities? Oohing and ahhing over the weekly torchlight parade and fireworks, belting out tunes in family karaoke and building a sled to launch from a jump in I-Did-A-Sled – all had approval ratings of more than 95 percent. Furthermore, based on its summertime success, S.T.E.A.M. activities bring fun ways to explore science, technology, engineering, arts, and math.